MotoXAddicts | Cooksey’s Hard Truth: Is the Amateur System Broken? Factory Team Green prodigy Jett Reynolds was absent from Loretta’s this year with an injury, but he is currently the most highly touted (and likely paid) amateurs in the game. Photo by: Andrea Barnett. Last week, I spent my evenings watching the 2018 Loretta Lynn’s Amateur National Championship. The racing was beyond exciting and some of these kids are not far from becoming the next stars of American Supercross and Motocross. Kawasaki, Husqvarna, KTM, Honda, Yamaha and Suzuki all have amateur representation. However, I couldn’t help but wonder about the kid who starts riding after the age of 10 or 11. Could he ever compete with a kid like Ryder Difrancesco or Carson Mumford? While these amateurs are talented and work hard, they are not the future because they are the best. They have been anointed the title of future star by receiving factory sponsorships before attending junior high. Can you truly judge talent at such a young age? Again, I am not denying the talent; I am simply offering up the nature versus nurture debate. The amateur system hand-picks specific kids who demonstrate flashes of talent at a young age. From that point forward, they are given the best equipment and training available. In a sport that is extremely dependent on the quality of motorcycle, this system writes off kids who develop their talents later in life. 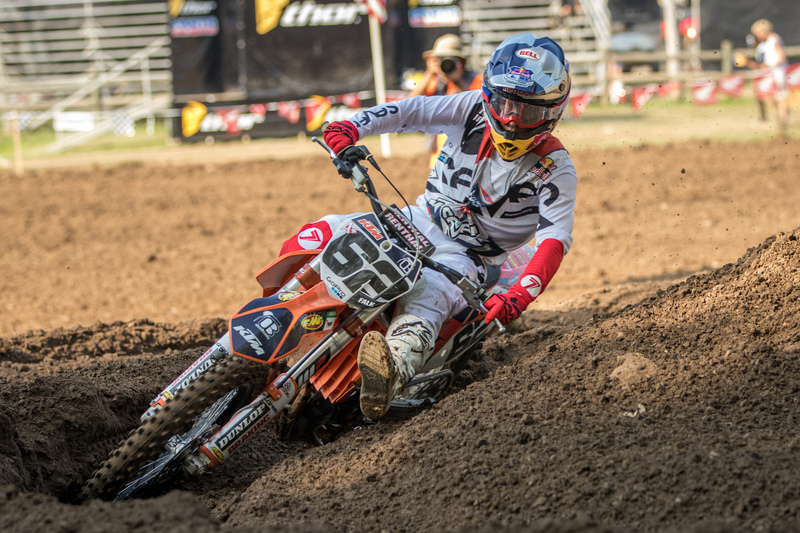 Is Ryder the best 85cc 9-12 rider in the country right now? Yes, but is it possibly because other kids didn’t have the same opportunities he did? I fully believe if ALL the manufacturers saved their support until riders were old enough to drive cars, it would positively change the face of the sport and increase the talent pool. I watched TLD KTM rider Mitchell Falk last week at Loretta’s and couldn’t help but think he is in for a tough time when he turns professional in 2019. Current TLD KTM professional rider Alex Martin was not offered a contract with the team for 2019; they had already signed Falk. Falk will be compared to Alex Martin who can win Nationals now and possibly again in 2019. Is this a situation where Falk is given too much too soon? Only time will tell, but what I know for sure is TLD would have been better suited to ditch their amateur program and keep journeyman pro Alex Martin. Before all the amateur parents start defending the current system and threatening my life, let me explain how this benefits everyone. Take a look at Chris Alldredge and Mitchell Harrison, two very accomplished amateurs who had unreal expectations placed on them, much like Falk is about to experience. If all professional teams saved the money paid to amateur riders, maybe they could give talented riders more time to develop their skills as professionals. What other professional sport asks 16-17 year-old rookies to produce instant results? Instant expectations are a direct result of teams wanting their years of investment to pay off as patience runs thin when they turn Pro. Instead of teams paying amateur riders, they could be offering developmental professional deals. Yes I know, it’s more likely that I will see a unicorn sliding down a rainbow than a team considering a developmental professional deal over the current amateur system. Teams and manufacturers could use the money currently being spent on prepubescent children and give money to young professionals learning the ropes. Simply pulling support for toddlers will solve many amateur racing problems and give opportunities back to later developing kids. I am well aware other sports also anoint stars at a young age, but they are usually swallowed up by more talented kids later in life. Out of the thousands of kids who have played in the Little League World Series since 1947, only 45 have gone on to have MLB careers and only a few became stars. What this tells me is Motocross/Supercross is manufacturing champions rather than letting them develop organically. If equipment was as important in baseball as it is in Motocross, you could bet more than 45 of these kids would go on to play in the MLB. In fact, it would be almost necessary for kids to play in the Little League World Series if only the best children were afforded the best equipment. Obviously, you will have a couple of outliers, but the current amateur motocross system breeds everything bad about youth sports. The crazy sponsorships being offered to children produce some cutthroat parents. Some parents are treating racing as a business when they should be teaching life lessons and enjoying this time and their children. The amateur motocross system today more often than not ends in divorce, drug addiction and life altering resentments. For every star in Motocross/Supercross, there is a stockpile of families that have mortgaged their futures and lost. Amateur motocross can be a glorious family activity if it stays amateur. Factory teams need to spend their money on actual professionals!